Organize Your Cables with Cordgo | BlackBerry Blast! Tired of messing with cords for your headphones and usb cables? Cordgo is a new product that promises to untangle that mess. Simply slip the cord into Cordgo and wind up the cord. The excess cord will be managed easily with this little accessory. It's perfect for joggers who want to control their headphone cables. "Cordgo is a one hand operated cord adjustment and storage accessory. 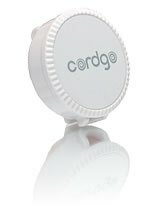 Cordgo's durable, lightweight design fits in the palm of your hand to deliver cord control. Adjust your cord to the perfect length every time. It's fast, easy storage saves you from ever having to deal with tangled cords again. Cordgo was designed to perform as an integral component between cord and digital device. Cordgo is not only great for headphones, it offers cord management for USB cables, hands-free mobile headsets, docking stations, FM transmitters... and more! Cordgo allows you to organize all your *cords, eliminating cord clutter."